As the days celebrations come to a close, the night just gets started and evening guests will arrive to a warm, exciting athmosphere with great entertainment and plenty of food and drink. 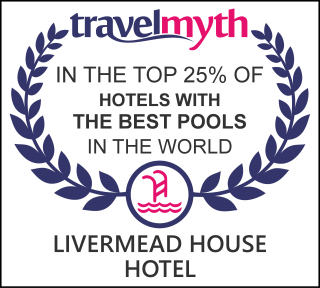 The Livermead House has fantastic purpose built facilities for live entertainment from a solo or duo act through to bigger bands. Our spacious Function Suites can accomodate up to 250 guests. We can organise dedicated specialists providing a wide range of live entertainment, ideally suited for your wedding party. Licensed Bars serve until late to provide the right sevice whilst your guests dance the night away. Choose from a variety of evening menus. These menus can be chosen on their own or, alternatively clients can mix and match. Dishes can either be hot or cold depending on preference. From an Evening Finger Buffet to a more formal Fork Buffet, you're sure to be impressed. All Finger Buffets are also served by Silver Service Staff from behind the Buffet table, once again The Livermead House going that extra mile to make your Wedding Day very special indeed. Get the party started with one of our recommended Disc Jockeys. You can discuss with them the style of music of your choosing. The DJ can provide music right through the decades to suite all family members and friends tastes. Please ask for more details regarding Bar times, our late licensing hours and prices of recommended DJ's. We have a great Dance floor to suit up to a maximum of 250 people. Come in and see us and we can talk you through your arrangements.